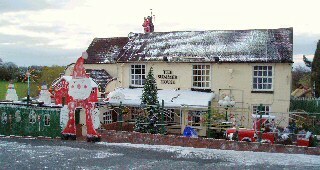 Gospel End’s only pub welcomes the Christmas season with an outstanding array of decorations. For the sixth year running it’s festive finery lights up the village. The display has cost thousands of pounds and runs up a weekly electricity bill of around £200. Young, and not so young, flock to see the illuminations and visit rooms with a winter wonderland appearance. ‘Snow’ adds to the surreal surroundings. Hosts, Pauline and John Coombes, spent weeks creating the delightful transformation and invite customers to share in their enjoyment. More on the Summer House can be found here. In July  Coseley Civic Trust’s provisional steering committee was formed. One major aim is to monitor and lobby for the restoration and retention of landmark buildings in an area roughly following the boundary of the former Urban District Council. This covered the Manor villages of Coseley, Ettingshall, Brierley and Woodsetton. Currently three sites are threatened with demolition - Mount Pleasant School used by Dudley Archives; Daisy Bank School used as a community centre and Innisfallen House used to access council services. The last two properties are owned by Wolverhampton City Council. The new Civic Trust will be backing campaigners already fighting to save these Victorian buildings, namely Friends of Mount Pleasant School and Bradley and District Community Association. The Trust’s chairman, John Wilkes, is willing to explain the scope of the Civic Trust which will also function as a building preservation trust. He is keen to recruit members interested in protecting Coseley’s heritage and enhancing future amenities. John can be contacted on 01902 491583 or through the Society's email. In August  the Trust was officially constituted and actively involved in saving Mount Pleasant School from demolition.